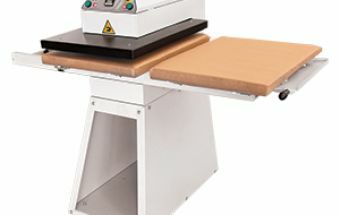 The PTA 850- AUTOMATIC HEAT PRESS is a fully automatic easy to handle printing machine. These heat presses has 2 trays, which allows for dressing the workpiece and apply prints up to an area of 520 x 720mm. While one piece is being pressed, the operator can prepare the next one, thus yielding a higher production speed. The pressing operation is facilitated thanks to its pneumatic system that makes the work much more practical and causes less fatigue to the operator. The upper heating platen features double Teflon coating, casted-in heating resistance and milled in aluminum to provide a uniplaten pressure over the entire platen area.